I like the summer season because I can stay outside on my beautiful outdoor set up, lie around all day on my hammock while enjoying a novel and some homemade piña colada. As much as I like the sun, however, I am aware the overexposure to it can lead to hazardous health risks. Like everything else in life, moderation is always the key to enjoyment. Thus, when the sun gets to be too hot, I go under the shade and enjoy the rest of summer from there. I was fortunate enough to learn that outdoor umbrellas are not the best source of artificial shade while I was making my decision on what product to buy. As its namesake suggests, sun shades take the cake in blocking out the sun during the summer. I bought one and I’m enjoying its benefits right now. You might be thinking, “Hold on, I like the sun. That’s the whole point of summertime after all, right?” Wrong! That would be similar to saying “I like the heater!” during the twilight of winter. If you really think about it, what you love is the warm feeling of heat that the heater brings about. The same would apply to the sun during summer time. If you stayed out under the sun the whole day, you’d more likely get skin cancer than enjoy the pleasant warm weather. So in short, you can enjoy the summer even without direct exposure to the sun. In fact, you need to protect yourself from excessive exposure by getting quality artificial shade to do that job. Personally, my philosophy is that every job or endeavor should be done extraordinarily well. I don’t like outdoor umbrellas because I think they do half-assed jobs in giving proper shades from the sun. People from other parts of the word refer to outdoor umbrellas as pool umbrellas because that’s how they are more popularly known and used. However, the bad thing about umbrellas, if you haven’t noticed, is that are supported or suspended from a particular point. Some outdoor umbrella models use poles to hold the umbrella up from beneath, while others suspend an attached umbrella from above. As such, the area it covers is limited and it is also often affected by sudden surges of the wind or the changing angles of the sun. Plus, they look awkward and all too commonplace. Conversely, sun shades are like canopies that hang from a higher point to give shade to those people bellow. You can be sure than an area secured by sun shades will remain shades and protected from the sun and its harmful rays. It actually also looks good and adds to the aesthetic appeal of any outdoor setup. 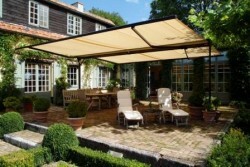 What do you think about sun shades and outdoor umbrellas? Share your thoughts in the comment section below and join in the discussion. While you’re at it, don’t forget to follow us on Twitter and also LIKE our Facebook page.